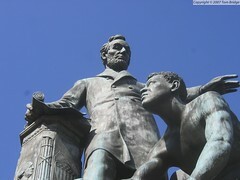 Today is one of DC’s unique holidays: Emancipation Day, celebrated each April 16th, to commemorate the signing of the Compensated Emanicipation Act signed into law in 1862. All city offices are closed today, including the DCRA permit center in SW and the DMV, and pretty much all of the rec centers, and there is no school today. Chances are, you have to work today, like we do, so we’ll be going strong here throughout the day. If you are off, there are a number of activities today, including a voting rights workshop on Capitol Hill.